Then in March of 1960, another mysterious satellite was discovered orbiting earth. This mystery satellite was in polar orbit feat that neither the US nor Russian were capable of at that time. The soviet satellites were inclined at 65 degree angle with the equator. It was calculated that the weight object to about 15 tons, which is far too heavy for rocket of that era. It also travelled twice as fast as any known satellite at the time. The object was sighted and studied by many of the astromoners across the country. It appears some nights, and some nights it doesn’t. In 1987 Shuttle Endeavour Mission STS-088 photographed a mysteries object orbiting the Earth. There are 5 photos of the object on the NASA web site. It clearly shows a large orbit circling the Earth. 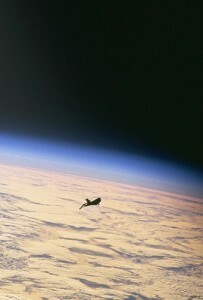 Is it possible that NASA inadvertently photographed the Black Knight satellite? 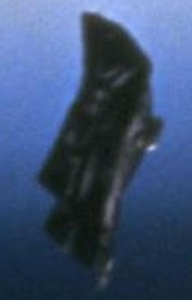 Could this be the same object Gordon Cooper spotted over Australia while on its 22 orbit on board Faith 7?